In comments bearing direct relevance for India, Prince Charles, heir to British throne, launched a scathing attack on gm crops, calling them the "biggest disaster of all time". Indians should not be losing sleep over a statement of the British monarch-in-the-making. But if one examines development on the gm front in the country, there is certainly cause for concern. Let us look at some incontrovertible facts which have surfaced recently. One of the most important parameters to test the safety of Bt crops is heat stability.Heat stability studies carried out on Bt protein in Bt brinjal highlight the very serious lapses on the part of the Genetic Engineering Approval Committee (geac), the watchdog of bio safety measurements of gm materials, of both plant and animal origin. Heat stability investigation is done to demonstrate whether or not the toxic Bt protein persists after cooking. Mahyco, the seed company in question, claims that once cooked, the Bt toxin gets destroyed. But facts prove the contrary. Bt protein is present even in non- gm brinjal before cooking. What can one surmise from this? Is it a serious slip on experimental procedure or is it that Bt brinjal and non Bt brinjal have been grown in adjacent plots without the appropriate "refuge" or safety distance in place? There are other disturbing facts. 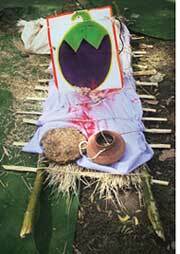 Mahyco has been conducting field trials on Bt brinjal in West Bengal in 2007. But, the matter was never communicated to the state government. In fact, a member of the West Bengal State Agriculture Commission has taken a very serious view of this because of the inherent dangers of contaminating the traditional brinjal varieties. West Bengal's apex agricultural university was asked to inspect the field trials conducted by Mahyco on Bt rice and Bt okra at a very late stage when the crops were ready for harvest. No meaningful data can be collected from such field trials. Most distressingly, the farmer on whose field the Bt rice was grown was never told what it was. There was a similar case in Tamil Nadu more than two years ago when irate farmers burnt the Bt rice crop. But the most damaging fact that recently surfaced concerns the data of the investigation carried out by the Indian Veterinary Research Institute (ivr), the apex research institute of the country in Izzatnagar, Uttar Pradesh, on the question of sheep and goat mortality after grazing Bt cotton leaves. For some time now, farmers and civil societies, have been reporting on cattle mortality in Warangal district and other parts of Andhra where Bt cotton was grown. Minutes of geac's 83rd meeting, held in April reveal that the agency's stand on the matter is replete with speculations and unscientific conclusions. For instance, it notes that "sheep death might be due to high nitrite or nitrate contents and not due to Bt toxin". ivri, vested with the responsibility of testing for Bt toxin on test tissue samples of dead sheep says that the samples taken were "not proper". It must be asked, if the samples taken were "not proper", how is it that the institute tested for other parameters like nitrite and nitrate? It's a matter of great concern that authorities vested with the crucial task of measuring bio safety of gm crops approach the subject in a ham-fisted manner and a lot of crucial data is kept away from the scrutiny of public under the garb of "commercial interest". Equally disturbing is the National Biotechnology Regulatory Bill, which contains provisions that would prevent democratic control of genetic experiments and harm farmers and consumers in the long run. It is so very shocking and surprising that though agriculture is a state subject, the Centre had not asked the views of states on the proposed legislation. I am not saying that gm technology has no place in India. What I am seriously concerned about is that we don't have a way to test the bio safety of gm crops, especially brinjal, rice, okra etc. Even Bt cotton seed when used as a feed for milking animals can be a source of human contamination through milk. Are we being pushed onto the gm bandwagon? If so, by whom?